Mobile-optimized streaming videos, gaming and music. 4G LTE for most everything else. 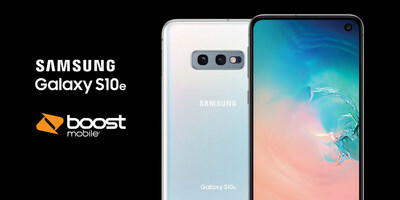 For full details on the device and pricing, please visit BoostMobile.com. "We aim to provide our customers a wide selection of devices – including the latest technology from leading brands like Samsung – that pair perfectly with our unlimited no-contract plans," said Angela Rittgers, senior vice president-Sales and Marketing, Sprint Prepaid Group. "The new Galaxy S10e offers the type of innovative features Boost customers look for, and we can’t wait to get it into their hands with no annual contract required." The Samsung Galaxy S10e builds on a decade of Galaxy breakthroughs for those who want all the premium essentials in a compact package on a flat screen. The new device features a Dynamic AMOLED display, an all-new camera with ultra-wide 123° field of view, Wireless PowerShare4, and new AI software that automatically optimizes battery. Customers can enjoy all of these features while saving money through Boost Mobile’s affordable prepaid phone plans. These plans include unlimited data, talk, text, taxes and fees and unlimited music streaming with data charges. 1 Offer valid now through April 15, 2019. Phone Offer: While supplies last. Excludes tax. New customers only; requires eligible port and activation on eligible plans $50 or higher and unlimited family plans; excludes ports from Sprint-related carriers. Select markets/retailers only (excludes boostmobile.com or national retailers). Select models only; no substitutions, cash back or rain checks. Limit one (1) device/line. May not be combinable with other device offers. 2 Offer valid now through April 15, 2019. Four (4) lines for $100/month: Available to new customers only; requires at least one (1) port; excludes Sprint-related carriers. Not combinable with other family plans. If one or more secondary lines leave, plan cost remains $100. Fifth line available for additional $30/month. Ineligible lines will be moved to the $50 single-line plan. If primary line leaves, secondary lines automatically move to new plan at next payment date. Primary responsible for monthly payment of all lines and their add-ons. Secondary lines pay their one-time/add-on purchases. 3 BoostUP! : Requires 18-month installment agreement, 0% APR and qualifying device and service plan. Eligible customers can finance up to $600. A down payment is required at time of upgrade. Sales taxes for full purchase price due at the time of the sale. If you cancel wireless service, remaining balance on device becomes due. 4 Wireless PowerShare limited to Samsung or other compatible smartphones with WPC Qi wireless charging, such as Galaxy S9, S9+, S8, S8+, S8 Active, S7, S7 edge, S7 Active, S6, S6 edge, S6 Active, S6 edge+, Note9, Note8, Note FE, Note5, and Samsung wearable devices including Galaxy Watch Active, Gear Sport, Gear S3, Galaxy Watch (46/42mm), and Galaxy Buds. May not work with non-Samsung accessories or covers. May affect call reception or data services, depending on your network environment.